Posted April 19th, 2019 . Somebunny special will be hoppin’ around The Marketplace at Hilltop Saturday, April 20th from 11-12. From 12-2, please join the Easter Bunny at Chick fil A for frees photos and a craft. Can’t wait to see you there! Look who hopped on over! The Easter Bunny had a fantastic time hopping around The Marketplace at Hilltop. To see photos and keep tabs on all things Hilltop, please follow us on Facebook. From 9 to 11 a.m., Santa will be at the Marketplace at Hilltop Chick-fil-A spreading Holiday Cheer. After visiting with Santa, you can enjoy holiday treats, beverages and special discounts from many of our retailers. The Holiday fun continues with face painting and crafts at Color Me Mine. Plus, when you shop at a Marketplace at Hilltop retailer on Santa Saturday, you’ll get a free poinsettia to take home, while supplies last. Just visit Color Me Mine or Chick-fil-A with a same-day receipt to claim yours. Santa Saturday is a great way for the Marketplace at Hilltop to thank our friends, neighbors and loyal shoppers and enjoy this special time of year together. We hope to see everyone there! Great news! Famed restaurant “Le Yaca” is bringing its traditional French cuisine to the Marketplace at Hilltop in Spring 2017. The popular casual and traditional French dining restaurant, which first opened its doors more than 50 years ago in a small French Alps village, will take over the space occupied by Burton’s Grill, which closed October 28. It will be the latest addition to our already inviting selection of retail and dining experiences here at the Marketplace at Hilltop, and one we couldn’t be more excited about. Le Yaca has two restaurant locations in Williamsburg and two in France, one in Saint-Tropez and the original in La Praz. All are beloved by the fine dining community for their original menu and warm hospitality, and we know diners from Virginia Beach and all across the Southside will love it just as much. 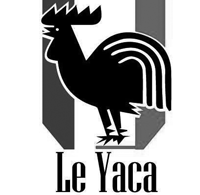 If you’re like us and simply can’t wait for Le Yaca to get here, you can learn more about the concept, its history and see the sumptuous menu here. With the lease signed, work should begin shortly to transform the Hilltop space and bring the Beach its first touch of the French Alps by Spring. Come celebrate the beauty of Autumn at the first-ever Fall Festival at The Marketplace at Hilltop on Saturday, October 22nd, from 11 a.m. until 2 p.m.
Plus, when you share a receipt from any Marketplace at Hilltop retailer and you can take home a free pumpkin. The Marketplace at Hilltop Fall Festival is our way of thanking our loyal customers and neighbors for all their support throughout the year, and we hope it becomes a great annual tradition year after year. Posted August 3rd, 2016 . We all know what time of year it is – the time when morning trips to the beach are replaced with morning trips to the bus stop. It’s sad to see summer come to an end, but that just means it’s time to stock up on all of your stylish back to school gear. 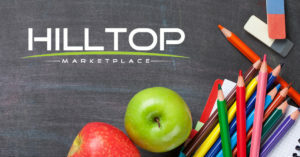 Get your back to school outfit from Apricot Lane, your new shoes from New Balance, your first day of school haircut from Gary Allen, and all of your school supplies from Michael’s, all at the Marketplace at Hilltop! Plus, you can shop Tax-Free this weekend only, August 5th-August 7th, and save even more money. We aim to provide a great shopping experience to our patrons at Marketplace at Hilltop inside and out. Here’s an award to prove it!